POSTED February 21, 2019 3:38 p.m.
ALBANY – A scream on a dunk jolted his teammates, and a crowd-silencing 3-pointer netted a school record. But Conner Meyer had only one thing on his mind: winning the ball game. “I came out here focused on getting the ‘W’ tonight. I wasn’t really worried about any records, I just wanted to win the game,” said Meyer after a 21-point performance in a 51-40 win over Albany. Meyer’s 3-pointer with 2:16 left in the first half game him nine in the game and set him apart from all former Black Hawk Warrior basketball players. The triple gave Meyer enough points (1,580) to pass current UW-Green Bay guard Jen Wellnitz for the most all-time in school history for either boys or girls hoops. Black Hawk coach Charlie Anderson said the record is more than just Meyer’s talent, though. A slow start to the game hampered Black Hawk. Albany (7-12 overall, 4-6 Six Rivers East) used a zone defense to stifle the Warriors’ offense – the same defense that scored the Comets a win in first meeting of the two teams Jan. 8. Black Hawk (10-10, 8-4) went without a field goal for the first five minutes and fell behind 9-1 after a Corbin Kelley 3. After Tyler Triem and Colby Argall knocked down 3s for Black Hawk, Meyer got in on the action with a jumper to pull to within two points at 11-9. Two minutes later, the Warriors switched to a zone defense themselves, which momentarily confused the Comets. Meyer picked off a pass and raced down the court, slamming home a breakaway two-handed dunk with a ferocious scream that startled the home crowd and energized his teammates. “I knew I had to do something to get the crowd going, so I had to slam it down. It was a good force of momentum for our team,” Meyer said. A possession later Lucas Flanagan came in off the bench and buried a 3 to give Black Hawk it’s first lead of the game at 14-13. Albany would hold its final lead of the game at 19-16 with five minutes left in the first. Then Flanagan made a cut to the basket in the paint, followed by five straight points by Meyer. Black Hawk closed the half on a 9-0 run and didn’t relinquish the lead. “It was just one of those nights where we just played together really well. We knew we needed revenge for the last time we played them, because that wasn’t a very good game for us,” Meyer said. Albany was hit with foul trouble early on. Leading scorer Josh Dahl picked up three fouls in the first half but remained on the court. In the second half, big man Rob Schroeder picked up fouls 2-3-4 less than 90 seconds apart and had to go to the bench with his team trailing 33-30 with 14:26 left. Meyer took over in the high post, scoring 12 points in the half and opening up the offense for his teammates. After Meyer’s 21 points, Kyle Lovelace, Argall and Flanagan each had eight. Off the bench, Flanagan sparked with a pair of 3s and two steals. “Lucas, he’s a ball of energy out there. He plays such good defense and he’s so active. We were struggling tonight and he hit some big shots to loosen them up a bit and allow Conner and some other guys to get inside more,” Anderson said. Kelley led Albany with 13 points, while Jamison Stauffacher had 11 points and 11 rebounds. Dahl finished with eight points and seven boards. “I think you saw the foul trouble when Rob went to the bench. It allowed Conner Meyer to get away from us for a little while,” Albany head coach Derek Allen said. Black Hawk dropped out of contention for a conference title after falling to league-leading Barneveld, 55-38, in a SRE make-up game in South Wayne on Saturday, Feb. 16, but the Warriors are still looking ahead to the postseason. The Golden Eagles (12-7, 9-1) jumped out to a 31-20 halftime lead on the strength of eight points apiece from Malcolm Reed and Evans, and then went on to outscore the Warriors in the second half, 24-18, to sweep the season series. Reed finished with a game-high 18 points and Evans added 14 points for Barneveld. Lovelace scored 11 points, Argall chipped in with 10 and Meyer was limited to eight to lead Black Hawk. Finally, at Orfordville, on Monday, Feb. 18, the Warriors finished off their regular season schedule by falling 82-74 in a non-conference shoot-out against the host Parkview Vikings (14-6). Black Hawk received the #7-seed in their regional bracket. The Warriors will begin the WIAA Division 5 tournament by hosting #10-seed Johnson Creek (8-11) in a regional quarterfinal game at BHHS on Tuesday, Feb. 26, starting at 7 p.m.
Black Hawk – Lucas Flanagan 8, Colby Argall 8, Kyle Lovelace 8, Tyler Triem 4, Rece Shelton 2, Conner Meyer 21. Totals – 19 8-18 51. Albany – Dahl 8, Anderson 2, Gertsch 2, Kelley 13, Stauffacher 11, Schroeder 4. Totals – 16 2-6 40. 3-point goals– BH 5 (Flanagan 2, Argall 1, Triem 1, Meyer 1), A 6 (Kelley 4, Stauffacher 2). Total fouls– BH 11, A 17.Fouled out– none. Barneveld – Reed 18, Gordon 6, Thompson 7, Peterson 4, Se. Sullivan 4, Evans 14, Arneson 2. Totals – 18 16-28 55. 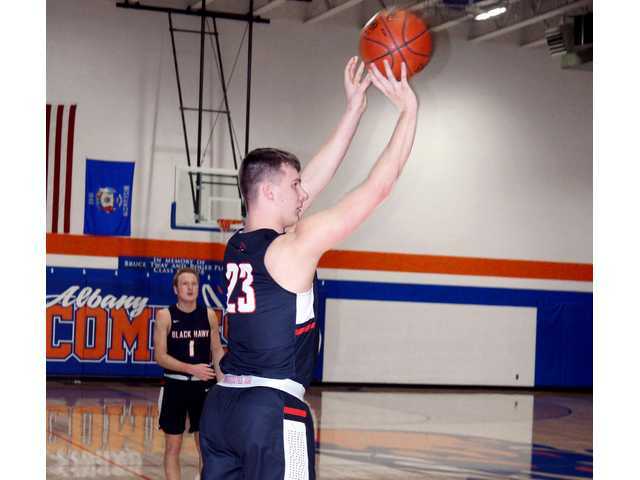 Black Hawk – Colby Argall 10, Kyle Lovelace 11, Tyler Triem 3, Rece Shelton 4, Avery Baumgartner 2, Conner Meyer 8. Totals – 11 12-25 38. 3-point goals– BA 3 (Gordon 1, Evans 2), BH 4 (Argall 1, Lovelace 2, Meyer 1). Total fouls– BA 24, BH 24. Fouled out– BH: Shelton, Meyer.